The Province of Alberta has taken a leadership position in the GHG emissions reporting and management area in North America and the rationale for doing so is clear. The estimated GHG emissions for 2020 from the Province are in the order of 305 Mt compared to 232 Mt in Ontario as illustrated below. 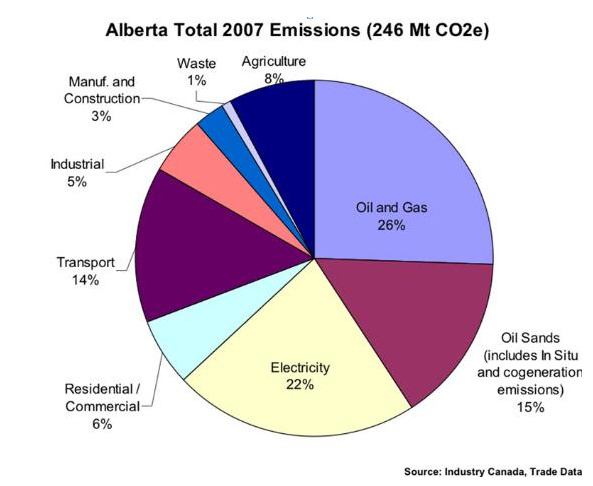 Alberta, with 10% of the population in Canada, owns 40% of the emissions. In particular, oil and gas exploitation accounts for almost 45% of total emissions in Alberta . 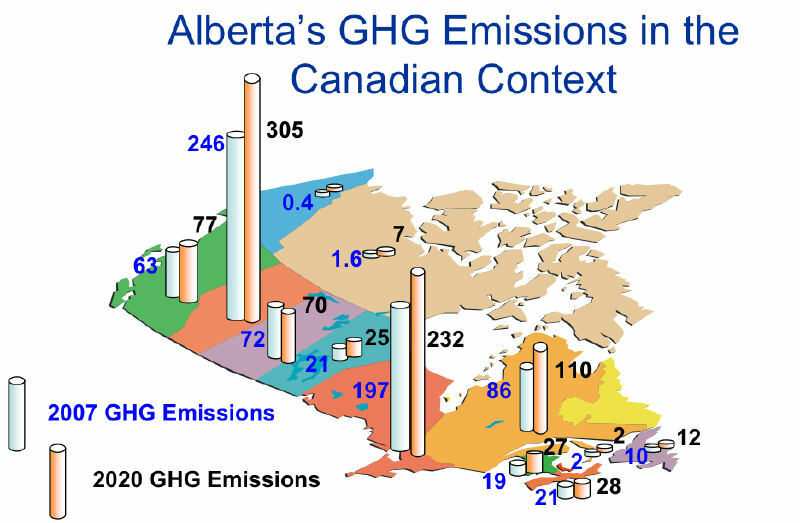 A more detailed breakdown of the emission sources in Alberta is presented in the next figure . Currently the threshold for reporting and mandated emissions reductions remains at 100k tonnes CO2E/y and reporting-only at 50k tonnes CO2E/y. All reductions are relative to a baseline, which is an average for 2003-2005. Market instruments and offsets have been used by industry and in 2009, 3.6 MT were claimed via offsets; $563 MM were paid to the technology fund and 1.2 MT were issued as emissions credits (for reductions beyond required). The technology fund received 231 proposals in their first call with funding going to 16 projects. A new call has been issued recently. This fund has allocated most of the resources to Carbon Capture and Storage (CCS) projects. The development process of protocols for offsets is required to ensure real reductions, however this is a slow and costly process (estimated around $80,000 per protocol by some industry consultants). Alberta is working with the Climate Registry to try to adjust methodologies. Verification of emissions also brings some difficulties in ensuring emissions reductions. Alberta is working with the National Standards Council and ISO to seek certification of verifiers. Regarding the various cap-and-trade and other GHG regional programs, it can be concluded that it is still unclear which one will emerge as the winner and that Alberta will have to adjust its own program to work with the rest. The Western Climate Initiative (WCI) seems to be growing in strength and BC appears to be fully committed to it. The key challenge for WCI is related to the cost that will be incurred with such strict reporting guidelines. The US EPA is expected to release shortly their Subpart W for process venting and fugitive emissions in oil & gas and that will also have a strong influence on the requirements. In any case what is clear is that companies in the oil & gas sector will have to develop systems to help them comply with upcoming regulations and/or participate in these emerging carbon markets. 1. “Alberta and the Environment” Presented at the REMTAP Workshop, August 31, 2010, Calgary, AB.